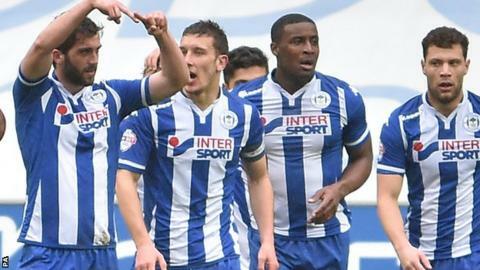 Striker Will Grigg scored his 23rd goal of the season as Wigan beat Coventry to move a step closer to promotion. Wigan raised the tempo after the interval and Grigg slotted home from Stephen Warnock's cross. The victory put Wigan four points clear of Burton, and 10 points ahead of third-placed Bradford, while it also extended their unbeaten run to 20 games. Two more victories from their five remaining matches will secure a return to the Championship, while defeat left Coventry in 13th place, 11 points outside the play-off places. "I think the performance again was excellent against a very difficult team to play against. "I knew they'd pose us a lot of problems and they did. "We looked very strong, especially second half I didn't feel in any danger." "It's been the problem for the past three months really, not scoring goals. "The grind of this league has taken its toll on us now. "I thought we worked hard enough, the commitment was there and the endeavour was there, but we're falling a little bit short at the moment." Match ends, Wigan Athletic 1, Coventry City 0. Second Half ends, Wigan Athletic 1, Coventry City 0. Foul by Jodi Jones (Coventry City). Foul by Joe Cole (Coventry City). Attempt missed. Marc-Antoine Fortuné (Coventry City) left footed shot from outside the box is high and wide to the left. Conor McAleny (Wigan Athletic) wins a free kick in the defensive half. Jodi Jones (Coventry City) wins a free kick on the left wing. Corner, Wigan Athletic. Conceded by Reice Charles-Cook. Penalty saved! William Grigg (Wigan Athletic) fails to capitalise on this great opportunity, right footed shot saved in the bottom left corner. Penalty Wigan Athletic. Conor McAleny draws a foul in the penalty area. Foul by Jack Stephens (Coventry City). Substitution, Coventry City. Marc-Antoine Fortuné replaces Marcus Tudgay. Substitution, Coventry City. Jacob Murphy replaces Romain Vincelot. Joe Cole (Coventry City) is shown the yellow card for a bad foul.